Acoustic levitation is some day going to be used to brush the dust off machinery on Mars. 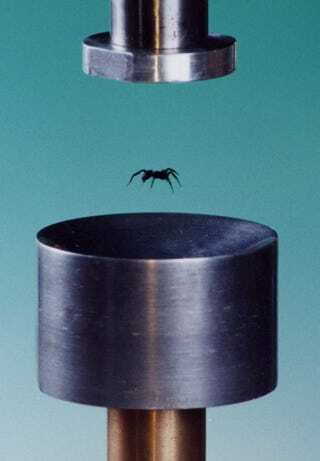 Learn why sound can lift objects off the ground and see an acoustic levitation chamber in action. "Sticks and stones may break your bones, but words will never hurt you." This saying is repeated by schoolteachers, parents, and bitter Io9ers who tried to fight off their muggers by yelling "Muad'Dib." Sound is generally categorized as essentially different from action. Although the ideas and feelings that sounds convey may be powerful, noise itself is considered harmless. But sound is action, and under the right circumstances it can have a very visible effect. Creating a sound is a little like shoving someone at the end of a long line. That person knocks into the next person in line before righting themselves. Each person only moves a little, getting shoved forward and then back, but the overall compression travels all the way down the line. Sounds are basically compressions of air hitting a human ear drum. When something makes a noise, it vibrates, compressing the air around it a certain number of times. The individual air molecules get shoved around just a little bit, moving up and then back – but the compression itself travels forward. Now imagine that the person at the front of the line has a short temper and doesn't care who they take it out on. When they get pushed, they turn around and push back. The compression travels back down the line to the original person who started pushing. Given that that original person is the kind of jerk who likes to shove entire lines full of people for no reason, that person pushes the unfortunate individual in front of them again, and the wave travels back and forward. Maybe the original person doesn't wait to be pushed back and start shoving once every five seconds. The pulses move down the line, and back up, again and again. If both sides time it just right, the different pushes, shoves, and general idiocy would come to a kind of equilibrium called a standing wave. Compressions would move through the line as usual, but while certain parts of the line would get pushed one way or the other like they're on swings, the person at the center getting slammed by both sides at the same time, carrying the momentum from one side to the other while staying in roughly same place, like the center ball in the toy they used to sell in The Sharper Image stores. That person is the node of the standing wave – the place that, in a longitudinal wave – moves the least. It is there where the objects accumulate in acoustic levitation. It's only at the node that they can accumulate, since when they move away from the node, they get shoved right back. Instead of people, sound waves are moving around air molecules, and although air molecules don't pack a lot of punch, the combined force of a lot of them pushing together is enough to levitate up to a few kilograms worth of material. At least, it's enough to in large, well funded facilities. At home the most people can hope for is light Styrofoam or a few drops of water. To make an acoustic levitation chamber, it takes a speaker hooked up to equipment that can make a precise, consistent sound wave. It also takes something that will reflect the wave back, to allow a standing wave to be established. It's best if both of these things are curved. After that, it takes patience, power, and waterproof equipment. You too, can do this. Just don't try it out with people in line. It won't end well. You really can't be sure that the guy with the bad temper is all the way at the other end. Via: How Stuff Works, and The Huffington Post.